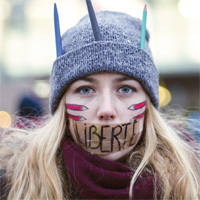 Editor's note: The recent Charlie Hebdo attack and Sony Pictures hacking have thrust into the spotlight threats against freedom of speech and freedom of the press around the world. Conversations at the national level have focused on how terrorism, including cyberterrorism, are impacting these sacred freedoms and what can be done to ensure these freedoms are protected. William & Mary and Colonial Williamsburg will be convening a panel discussion focusing on this controversial topic April 6 at 3 p.m. in Alan B. Miller Hall, home of the Raymond A. Mason School of Business. By the time the rampage was over, the gunmen had killed 12 of the magazine’s staff and had seized the world’s attention. In response, millions of people all over the world marched in solidarity with the free speech values Charlie Hebdo espoused. They carried pens and pencils and chanted “Je suis Charlie”; George Clooney said the same onstage at the Golden Globe Awards. Pundits across America fumed over why President Obama hadn’t dispatched a high-level state official to march alongside French President François Hollande and 40 other world leaders in Paris on Jan. 11. One of our founding principles, the First Amendment, was back in the spotlight, and we believed freedom of speech would again triumph over threats to its existence. But it’s not that simple. Threats to free speech are complex and intricately linked to one another, and fused with concepts of identity, history and technology. It’s not simple at all. as banal as Catholicism.” The mockery — and the threats — continued. Charbonnier was killed in the January attacks, which were widely said to be a response to Charlie Hebdo’s continuing disrespect of Islam. Content limitations on freedom of speech are much more common abroad than in the U.S. In France, while blaspheming Mohammad is perfectly legal speech, denying the Holocaust is not. In America, despite many foundational similarities with Western European democracies, the climate is rather different. America, he says. Second, since newspapers are the main source of political cartoons in the U.S., the last few decades of newsroom cuts have left many cartoonists without jobs. Fewer papers with fewer cartoonists means taking Charlie Hebdo-type risks is practically unheard of. Unlike Boston, many American cities have seen two or more newspapers consolidate and contract into only one. “Now, if there’s only one cartoonist, it’s going to be more lightweight in the humor and appeal to everybody,” said Dernavich. Max Fisher ’08 is a content producer for Vox, covering primarily foreign news. For Vox, the cartoons were part of the news and it therefore made sense to publish them with their coverage of the attacks. But Fisher also understands the argument not to. Dernavich, like Fisher, understands the editorial concerns that play into decisions to run or re-publish controversial material. He remembers a difficult decision at The New Yorker following the attacks of Sept. 11, 2001. Dernavich recalled fellow cartoonist Alex Gregory’s “mild” take on a suicide bomber visiting a tailor’s shop. The work never got published, he believes, because the cartoon felt too personal for the magazine’s New York staff. Good judgment, said Fisher, is critical. There is no justification for the use of violence, he said. It’s important, however, to understand that free speech does not occur in a vacuum. “Nobody is arguing for taking away the free speech of Charlie Hebdo or people like them,” he said, “but it’s a question of how responsibly are they using that power of free speech. The American hue of gray doesn’t look like the French shade, nor the German or Danish. When comparing the First Amendment in America to free speech worldwide, each country chooses its own path. In fact, the debate is older than the United States itself. The freedoms that we cherish today can be traced to the Bill of Rights and have roots reaching back to the oldest public college in the nation — William & Mary. Thomas Jefferson 1762 had read Milton by the time he arrived at William & Mary as a student. When he later studied under prominent jurist George Wythe — the first-ever law professor in the U.S., who taught at the College — he found a perfect match: they both valued legal education alongside the humanities. They remained close collaborators and political allies for decades to come. As Wythe’s student, Jefferson witnessed firsthand his teacher’s fierce opposition to a landmark threat to free speech in pre-Revolutionary America: the Stamp Act. The Stamp Act was a tax on paper in the American colonies, requiring many important documents to be printed on specialized paper that could only be bought with British — not colonial — currency. It was designed to raise money for British armies abroad. But to Americans, the Act looked for all the world like a Parliamentary attack on colonial self-government, commerce and free speech. Wythe wrote to the House of Commons in 1764, protesting the Act before it was passed the following year. He developed a slight reputation as a revolutionary. Widespread opposition to the law spread throughout the colonies, surprising the British authorities and stirring the rebellious spirit that would come to a head a decade later. By 1766 the Stamp Act was barely enforced at all, but its mark had been made on Jefferson. “Our liberty depends on the freedom of the press, and that cannot be limited without being lost.” In 1787, Thomas Jefferson wrote these words to Dr. James Currie. Jefferson was in Paris during the Constitutional Convention, and did not sign the governing document himself. But he took threats to free speech seriously, as evidenced by his presidential campaign in 1800. On July 14, 1798 — Bastille Day, incidentally — Jefferson’s predecessor John Adams signed the Sedition Act into law, a grave threat to free speech in the United States. Under the Sedition Act, newspaper publishers could be found guilty of treason, should they print “false, scandalous, and malicious writing against the government.” All the more alarming was the notion that the president would have discretion over what speech qualified as treasonous. Adams had a dangerous tool to defend himself from his numerous critics; Jefferson would have tremendous ammunition against him in the 1800 race. That same year, Jefferson secretly authored the Kentucky Resolution in response to the Sedition Act. Therein, he outlined the idea that, should a state find such a law unconstitutional, that law would have no force in that state. for the White House in 1800 — and then pardoned the 26 men Adams had prosecuted with it. Without advocates like Wythe and Jefferson, and the influence of thinkers like Milton, these early obstacles may not have been overcome. But despite their influence and stewardship, the obstacles those men faced centuries ago don’t look much like our challenges today. So why, in January, did CENTCOM’s Twitter account link to this statement: You’ll see no mercy infidels. ISIS is already here, we are in your PCs, in each military base. With Allah’s permission we are in CENTCOM now. We won’t stop! We know everything about you, your wives and children. U.S. soldiers! We’re watching you! The impact on free speech has since become increasingly evident. According to several media reports, many wives of U.S. soldiers have decided to log off and abandon social media entirely, fearing that terrorists were monitoring their public comments. Posting to Twitter and Facebook wasn’t worth exposing their families to these vivid threats. 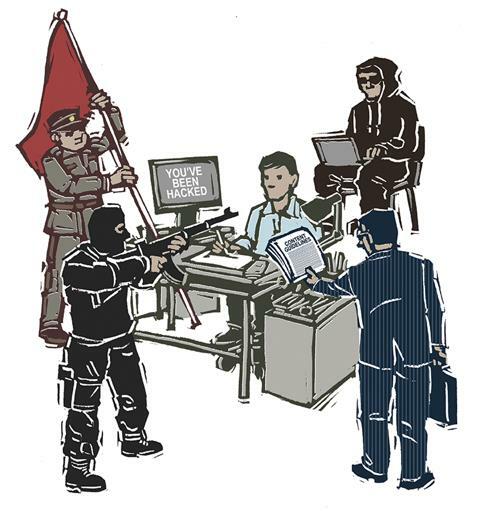 Hacking as an intimidation tactic, or “hacktivism,” is an emerging threat to the online world, according to Andy Purdy ’73, chief cybersecurity officer for Huawei USA, one of the world’s largest providers of telecommunications equipment. CENTCOM got hacked. The CIA website was hacked in 2011. Major national newspapers like The New York Times get hacked with some frequency. But then the threats came to Hollywood. A series of leaks emerged from information on Sony Pictures’ servers: emails, Social Security numbers, salary information and personal data. The hackers called themselves the Guardians of Peace. They demanded that Sony cancel the planned Christmas Day release of “The Interview,” in which the CIA hires a talk show host to assassinate North Korean leader Kim Jong-Un. It’s a comedy. Should Sony not cancel the film, the Guardians of Peace promised to strike at any theater showing the film. As theater chains proceeded to back out of showing the movie, Sony was forced to cancel its release. The Guardians of Peace had succeeded: they suppressed “The Interview.” The speech was not spoken as intended. “The anonymity that characterizes the Internet makes it easier for hackers to do what they want to do and get away with it,” said Purdy, who directed the National Cyber Security Division of the Department of Homeland Security under President George W. Bush. The U.S. government later found Guardians of Peace to be linked to the North Korean government, although Purdy says that opinion is not universal. During Purdy’s tenure at Homeland Security, he oversaw the United States’ first-ever exercise simultaneously testing cybersecurity responses from international, federal and state governments along with private organizations. He stressed that the sort of electronic attacks that get attention — information leaks or Twitter impersonation — are nothing compared to the kinds of leverage terrorists could gain with an attack on critical infrastructure. Whether to suppress speech or do something worse, our networks are vulnerable. Purdy consistently pointed out that security — the capability of organizations to keep information secure and private — can’t be an end goal. It has to be a process. The better we get at protecting our networks and data, the fewer vulnerabilities are available for hackers to exploit. A preventative and collaborative approach is invaluable. Safety for people who speak their minds — artists, journalists and anyone speaking truth to power — is imperative. But there is no hope of confining controversy to a magazine’s small circulation or the interior of a movie studio anymore. The rise in threats of terrorism, cyber attacks and intimidation may lead to changes in the interpretation of the First Amendment, said Tim Zick. Andy Purdy, who was a news producer for NBC, CBS and others before entering the realm of cybersecurity, knows these challenges firsthand. The balance is critical in any kind of pluralist society, but that is only one of the many First Amendment questions that are beyond the scope of any single article. And good judgment isn’t the only way to defend against threats to free speech. For Drew Dernavich, being provocative with speech is part of his job as a cartoonist. If something must be expressed, he suggests, no intimidation will prevent word from getting out. No rules can suppress it. It’s the same spirit that animates scholarship and revolution alike. In the end, “The Interview” did find an audience. Sony opted to release the film online instead of through traditional theater chains. The hackers’ digital threats led ironically to digital distribution. Intimidation didn’t win. This story originally appeared in the spring 2015 issue of the W&M Alumni Magazine.